Vinyl billboard blankets have been draped over all kinds of buildings, but they’re not usually found obscuring the glittering luxury outlets along East 57th Street. Chanel, however, has done that very thing: hanging a big piece of vinyl over its building at No. 15, promoting Mobile Art, an exhibition by the architect Zaha Hadid that opens in a temporary pavilion in Central Park next Monday. 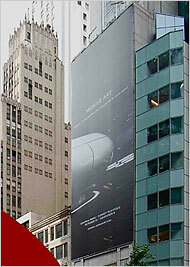 The show was described by my colleague Carol Vogel as a “provocative advertisement” in and of itself. So this billboard is, in effect, an advertisement for an advertisement. And it is illegal, the Buildings Department said, after City Room brought the sign to the agency’s attention. Although the department was focused Thursday on an international conference about crane safety, Kate Lindquist, a spokeswoman, said it was issuing two summonses, returnable before the Environmental Control Board, for installing an advertising sign without a permit and for obstructing windows. Each violation carries a maximum penalty of $15,000, she said. Telephone and e-mail requests for comment from Chanel over the last two days have gone unanswered. The Chanel building is in a C5-3 zoning district, where the only signs permitted are those that are “accessory” to activities taking place on the same lot. In other words, Chanel can have a sign for its own store. But even allowable signs may not exceed 200 square feet in a C5-3 district, and the Mobile Art billboard would seem to be at least 2,000 square feet. Signs may not be higher than 25 feet above the curb, and again, the Mobile Art billboard fails the test.